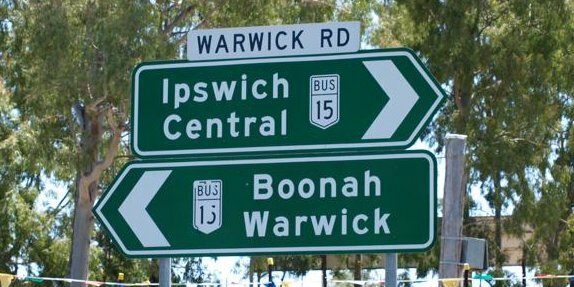 Intersection directional sign at the junction of Warwick Rd (former BUS-NR15) and Carr St at Ipswich. Image © Rob Tilley. This page covers routes located across Queensland that have had their route numbers decommissioned. Route numbers are usually decommissioned because their importance has diminished or the numbering system becomes defunct. The green and gold route markers indicate routes which are part of the National Highway System. They indicate the most direct routes between major cities. The black on white markers indicate highways around Australia which are not part of the National Highway System but are still of some national significance. Used solely in the Brisbane metropolitan area to indicate main urban routes. They generally form the shortest routes from one side of the city to the other. Used solely in the Brisbane metropolitan area to indicate freeway routes.